According to a note in the hand of William Morris at the end, rebound in 1894 at the Doves Bindery in oak boards backed with brown leather, two clasps, in a brownish-green case. William de Vescy (1245-1297); obituary of John Giffarde (1348); owned in 1561 by the Cambridge antiquary Robert Hare; William Morris (purchased from Quaritch in 1892); Richard Bennett (purchased from Morris's estate, 1897); Catalogue of manuscripts and early printed books from the libraries of William Morris, Richard Bennett, Bertram, fourth Earl of Ashburnham, and other sources, no. 18; purchased by J. Pierpont Morgan (1838-1913) with the Bennett Collection in 1902; J.P. Morgan (1867-1943). 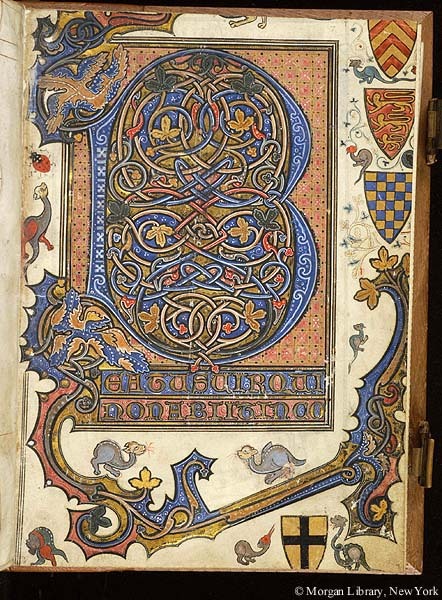 Ms psalter; calendar for London; written and illuminated in England, perhaps in the diocese of London, ca. 1290-1300. Decoration: Beatus page with armorial decoration, 12 large decorated initials, 4 shields with arms: of William de Vescy (or, a cross sable), Clare, England, and Warrenne, on fol. 7.